Where in Kensington do you live? It might seem like an odd question, especially if you are new to the neighborhood, but Kensington is actually composed of several different subdivisions, each mapped and built out at different times. In each subdivision are various historic objects in the Public Right-of-Way (PROW) that contribute to our understanding of the history of how Kensington developed and how its residents lived. 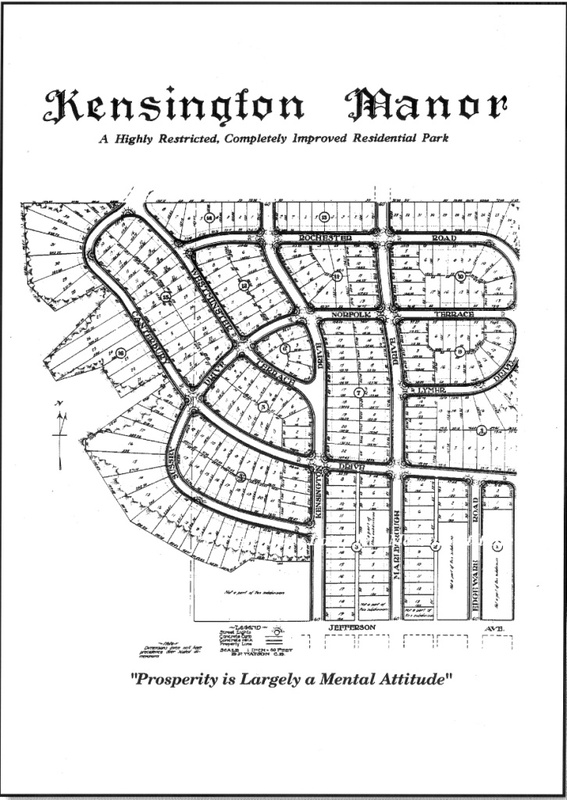 Kensington Park, the oldest subdivision, was first mapped in April 1910. Kensington Park was bounded by Terrace Drive on the west and County Road (now 42nd Street) on the east, and Jefferson Avenue (now Alder Drive) on the north and Monroe Avenue on the south. 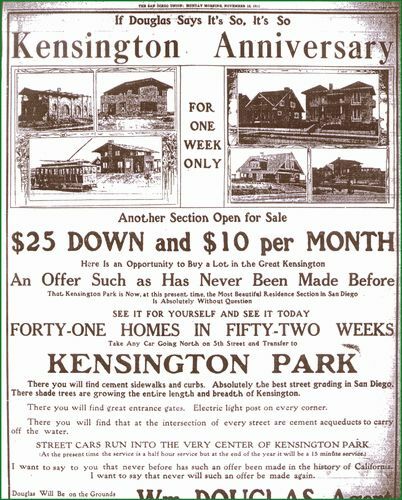 When Kensington Park was “opened” by agent William Douglas for the sale of lots on Thanksgiving Day, November 25, 1910, there was little more than dirt sidewalks and the streets laid out, with cobblestone pillars marking the boundaries of the subdivision. Almost one hundred years later, the original light posts are gone, and only one original cobblestone entry pillar remains in its original location, at the south-east corner of Edgeware Road and Monroe Avenue. Other entry pillars have been relocated and rebuilt at the corners of Monroe and Terrace Drive, Madison Avenue and Terrace Drive, and at Adams Avenue as you first enter Kensington from the bridge. It’s doubtful that any original cement sidewalk remains, but as you walk around, notice that the sidewalks vary in pattern and color. Sidewalks were poured at varying times in sections, and at the end of each section the name of the sidewalk contractor and the year it was installed is stamped. These sidewalk stamps have become a sort of collector’s item, and help tell the story of the growth of our little village. You can still see the original name of Madison Avenue, Mission Drive, stamped in the sidewalk on the northeast corner of the intersection of Edgeware Road. 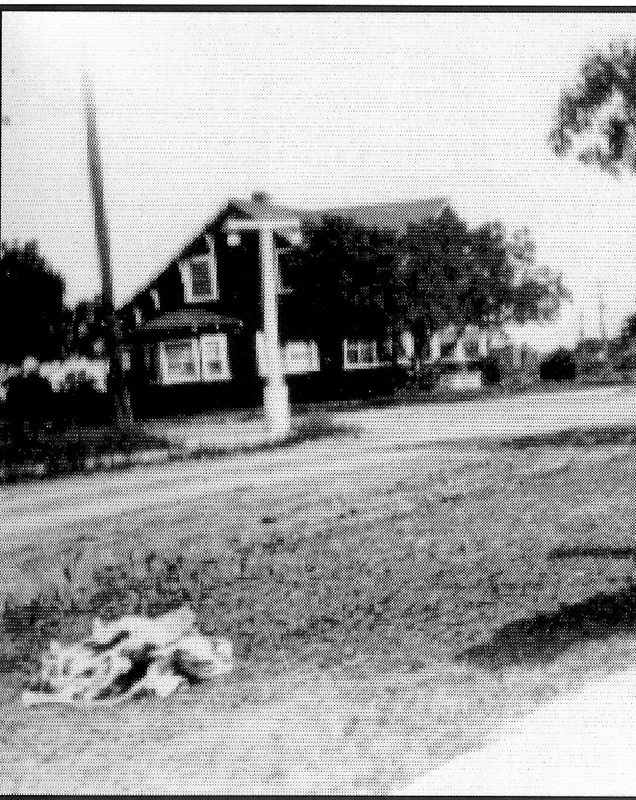 In the Kensington Manor subdivision, north of Alder Drive to approximately Hilldale Road, the original street lamps are still located throughout the neighborhood. The same decorative street lamps can be found in the Talmadge Park subdivisions, around East Alder Drive and Talmadge Circle. Look around for a few sidewalk stamps here and there. Many have disappeared from the ends of the stretch of sidewalk when ADA-compliant wheelchair ramps were installed, but a few can still be found in the middle of the block, or where there are rounded corners with no street access. In Kensington Heights, the historic lamp posts change to a distinctive “crown” style globe, found nowhere else in San Diego, but found in Pasadena. Since Kensington Heights was developed by the Davis-Baker Company, the same developers who built Pasadena, the same lamp posts were used in both places. Unfortunately, when one breaks the City has been replacing the globe with the same style as is used in Kensington Manor, instead of with an historically accurate replica, which are available. A third style of street lamp post can be found along Adams Avenue and along the bridge that crosses over SR-15. A few can be found on Terrace Drive just north of Adams Avenue in the parking lot area near the mini-park. 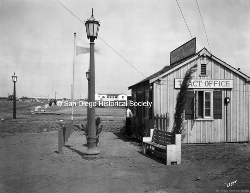 It’s not clear when these lamp posts were first installed but may have originally accompanied the San Diego Electric Car system, also known as the streetcar. One route used to travel the length of Adams Avenue into Kensington as far as Edgeware Road. Look carefully and you’ll notice that the lamp posts for each of the three styles of street lights are different. The crown style of street light in Kensington Heights features a Greek key pattern on the pole, which is clearly different from the stylized floral pattern on the poles found on Adams Avenue. Even the occasional historic manhole cover can be found. A manhole cover with “Bell System” emblazoned on it can be found in the roadway on Ridgeway Drive. Does anyone know why there is a sundial in the parkway on Madison Avenue between Terrace Drive and Kensington Drive? Dated 1943, it is inscribed in Latin with “Sic Transit Gloria Mundi”, which translates literally to “So goes the glory of the world” or loosely to “Fame is fleeting”. It is constructed of brick and cement. It may be a memorial to someone lost during World War Two. If you know anything about this wonderful object, please tell us! Look up, look down, look around. History is all around you in Kensington. Historic California Pepper Trees in the Public Right-of-Way on Madison Avenue. These trees are over 100 years old!